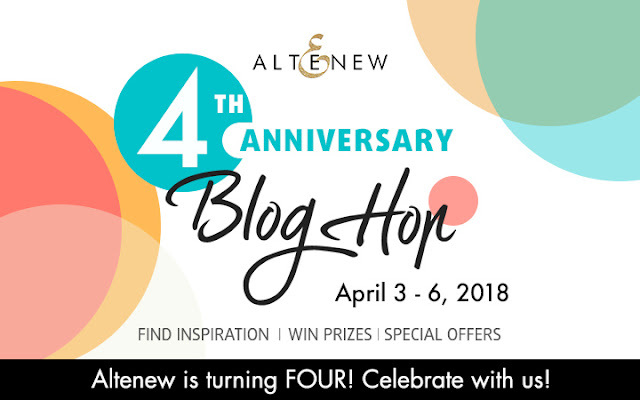 Welcome to the Altenew Anniversary Hop! Have you just been blown away by the projects on this hop?! You should have arrived from the Chameleon Pens Blog. If you are just stopping by you can start the hop over on the Altenew Blog. And you're going to want to because the giveaway on this hop are incredible! I thought it would be fun to create a really beautiful flower bouquet, and you know Altenew rocks though right?! and combine it with a harder edge geometric look. The Trigonometry set fit the bill perfectly. I stamped my bouquet and colored it up with my Altenew Alcohol markers before die cutting it out. I originally had a different background idea in mind but ended up stamping the open triangle in a simple diamond shape to frame my flowers. You can see the whole card come together in the video below. I really love how simple but striking this whole design is. I'm totally in love with the way it came out! Your next stop on the hop is super talented Flora Monika Farkas. I'm sure she's going to blow you away! Love this! I have such a fondness for black lines and bright flowers! I love the bold geometrics with the beautiful flowers. You make my jaw drop as I watch you color. You are fantastic. Just a little secret between you and me...I rarely watch YouTube videos over 15 minutes but you are the exception too the rule. You have great tips as well as great stories!! If watch your videos of if they were an hour long!! Gorgeous! I love the contrast of the triangles with the flowers, that was a brilliant idea. I love this stamp and your coloring. You so inspire me. Altenew has so many great flower stamps! Putting that sentiment there, awesome idea!!! It's a nice sized stamp too, I like it when you can find stamps that fill up the whole card. Coloring is awesome. Thanks for sharing. Love the way those geometric shapes pull your focul point into the flowers! wow so much detail! great coloring! Love how you mix florals and geometric patterns. I love your videos always, and this is no exception. Gorgeous! Love the triangles behind the flowers, super pretty. Love the black and white contrast with the bright colouring of the flowers! Absolutely breathtaking! It looks as if you could feel the texture of the flowers! So realistic and amazing! TFS! you have such patience when it comes to coloring. I do with watercolors but not with markers thanks as always for sharing. Gorgeous!!! I love the layout of your card as well as the coloring. The florals from Altenew are always stunning. Beautiful card. I watched your video on this card. I don’t know which I like better, your stories or the cards! So, I’m not going to choose. Although, the cards, as always, are lovely. It's a great combo! The black bold shapes set off the colorful flowers! Gosh, this is a great look! Your colouring, as ever, is just beautiful. Beautiful card! I like your incorporation of the geo shapes! And as always your colouring is so professional! I love Altenew.. congrats! Beautiful! Thanks for sharing your talent. This was my absolute favorite of the hop. Thanks for the wonderful video. Love the card, your persistence to make it how you want it AND I love your personal stories! Thank you for sharing! What a great idea to use the shapes behind the flowers on your card. Thanks for the inspiration! Gorgeous work. Love the dimension and abstract design. Your cards are always beautiful! You did a great job on the flowers. Thanks for sharing and have a wonderful week. Your card is gorgeous, Kelly! And, your video was too, too funny! Love your personality and your talent with coloring and design. Very beautiful card. Love how you used the geo shapes. Thanks for sharing..
Love this card. Your work always fills me with such inspiration. Thanks. Wow this is a stunning card!!!! I love the background you created for the bouquet to rest on. Fabulous! Gorgeous design, Kelly! I don't think it's 100% your usual style, I wouldn't have guessed straight away that it was your card, but it's really lovely! I really like this card. It reminds me of stained glass. I love the way your buds were colored, so very pretty. Gorgeous card! Love the pretty colors. it's a perfect combinatin of two different styles ! congrats !! Your coloring is always gorgeous. I really enjoy your videos. Great idea with geometric and flowers! That's a super pretty card!! Love it! Your blog is the highlight of my day. And I can't wait to watch this one. This card is amazing!! Gorgeous card! Love the flowers!! Thanks for sharing! Always out of this world cards. I'm with you Kelly.....I Love It Too!!! Gorgeous card Kelly. Love the pretty flowers. Fantastic coloring! The geometric shape background looks great! Beautiful card Kelly, love your colouring as always! The geometric background gives a total different look to the card! Great idea! Your card just beautiful. I really liked both background. Your stories are priceless. My grandson is the same with his dad. Thank you for sharing. This is such a unique design and I love it. Creative and beautiful. Thank you! Love, Love, Love to watch you color the roses...beautiful. I always love your cards and your coloring! The card is just stunning! wonderful design - beautiful coloring!! Love how you used the triangles to frame the flowers! So uniquely used the triangles...very pretty...thanks for sharing!! Oh I love this! The triangle shaped really draw your eyes into the gorgeous bouquet of flowers. What a super awesome card! Thanks for sharing. Amazing card! Thanks for the inspiration! I like the neat geometric background. Very beautiful flowers. Beautiful coloring for these roses! Really like the geometric background to go with the roses! This is such a beautiful card Kelly. I love the Geometric background and the bouquet, good save on the bud! haha You did a great job! An inspired combination - just gorgeous! Beautiful cards. I love the geometric background with the rounded flower shapes. Striking. I love how the background acts like a hanging planter for those beautiful flowers! Altenew has beautiful flower stamps. Their build-a-flower sets are amazing. I can't wait to see what stamps they come up with next and see all these talented ladies show case Altenew stamps with their beautiful cards they share with us all! Thank you Kelly , as always you did a beautiful job . I love this card . You are so very talented and inspiring. I absolutely love watching your videos . They are helpful and entertaining. You are without a doubt one of my favorites ! Love story time and watching you color! Your explanations of how and why are great! Oh boy, just another Kelly gem! You always inspire and thank you for that! Your videos are always a treat and also a free coloring lesson!! Happy 4th Anniversary Altenew! What can be said about this? Simply Gorgeous!!!! BEAUTIFUL!!! Thank you once again. Your work is amazing and I love the stories. I think you should post a recipe for little chicken! Your husband must be amazing too. Thank you for sharing. Pretty design with the triangles and I like your coloring. This is the best video .... Love the card, am mesmerized by your coloring and best of all--you make sense to me. Love hearing your life stories. Kelly--you ROCK as does Altenew-my favorite company by far!!! I just realized that I can't let a day go by without having a "Kelly fix." Today's video just made me smile. You are DELIGHTFUL ... and talented. LOVE everything about this card. Thanks for the great stories. Beautiful card with gorgeous products. 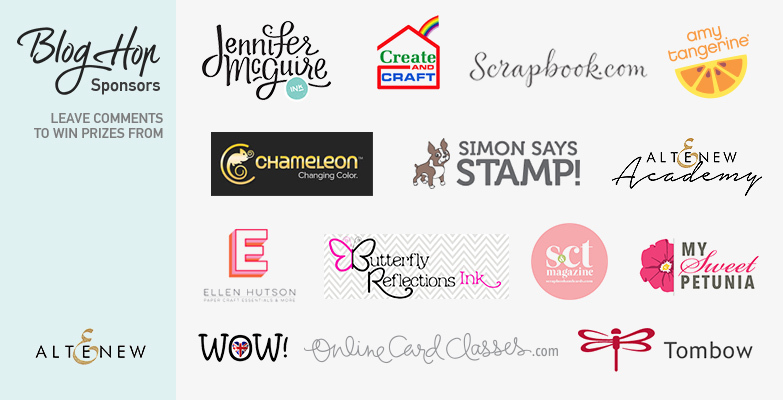 Congratulations to my favourite stamp company! I'm so glad I discovered Altenew early on with one of my all-time favourite stamp sets - Vintage Roses. Since then I have been stunned again and again by their beautiful products - especially their layering flowers. Here's to many more happy years! I love your idea of combining geometrics with the flowers Kelly! You have sold me on these two stamp sets. I wouldn’t have chose them but this is a beautiful card. Thanks. Your coloring is lovely, as usual, but those black triangles really made it pop/took it to another level. Love, love, love! Thanks for sharing your time, your talent, and even your family stories with us. I love having lunch with you! Happy Anniversary, Altenew! WOW! Amazing card with the triangles behind the flowers. It is beautiful!! I love this card! Very fun design! I love the elegant flowers with the graphic triangles. So beautiful!! No shame, Kelly! We have all been there. Love your card and your story! I love the contrast of the black triangle diamond shape with the beautiful florals. Will watch the video when I have time to sit. Interesting design, it really makes you see the whole arrangement. Fabulous. The black and white framing really sets off the colors of the florals. Very cool! What a beautiful card. It reminds me of stained glass! Love watching you color these flowers and I learn so much! Beautiful card, great coloring. Thanks for the video; I learn something new everytime I watch. Hope you got plenty of rest!! |You are quite right. That diamond pattern behind the flowers really sets it off. Gorgeous. What a striking card, especially accented with the diamonds in the background. Beautiful job on your coloring. Beautiful card, Happy Anniversary Altenew! I had to smile at the permission to come back for the video! I have sort of gotten in that habit, especially when a hop starts on Tuesday and I have to do my "real" stuff first! I actually saw this on my YT feed earlier today and thought it would be the perfect thing to watch as I settle in this evening. (I know they say don't do devices before bed, but it's how I chill before I go to sleep!) Can't wait--I already love the contrast of the geometry with the florals. Thanks. Your card is simply gorgeous. Love that diamond background!! Great technique to frame the floral center! It is beautiful! What a beautiful card. Thanks for sharing such inspiration. Love the triangles in the background; very creative! Altenew flower stamps are great! I enjoyed your video and watching you put this combination of the lovely colorful flower bouquet and the geometric shape background together. It is beautiful! I have out your video on my "To watch" list! That card is SO pretty - your coloring is fabulous! Kelly, I love your card, the colors are beautiful! Happy Anniversary Altenew! The simple black and white background with that amazing shape you created with the triangles is amazing and the perfect setting for those bold beautiful flower spray. You're videos are seriously a bright spot in my week. Thanks for sharing! LOve what you did with the florals and geometric frames. Super! Love what you do with Altenew’s beautiful flowers! Wow, those geometrics really make your card pop. What a spectacular look with the goemetrics behind the flowers! Love it! your cards are always gorgeous! thanks!! I wouldn't have thought of putting the geometric shapes with the beautiful floral design, but it works! Happy 4th Anniversary to Altenew. Kelly, I love how you combined the graphic triangles with colorful floral design. So beautiful! I love watching you color! Such a pretty card! Fantastic card. I LOVE the bold graphic background to ground your floral spray. What an awesome design! It’s beautiful, Kelly! Why does this remind me of the Greatful Dead and Pink Floyd albums. Very cool! Love the bouquet and how you used the geometric shapes on the card. Big Wow! Really enjoy the use of the geometric and floral together. Very nice card. Nice card-good combination of different stamp sets. Like all the colors. Fabulous card! I think the sentiment at an angle worked perfectly. As ever, your coloring and video are outstanding! I love the softness of the flowers with the hard edges of the triangles. Very dramatic! Such a beautiful card, lovely flowers too. I never would have thought to put the triangles and flowers together like that. Awesome! Can't wait to go through my stuff and find what I can try. I love your card. This is such a lovely, fresh card. The geometric design behind the flowers is a great idea. Yes, Kelly, your card is simple but striking! Using those black triangles behind that beautiful flower bouquet is really stunning! Your coloring is awesome, too! Thanks for making a video...can't wait to watch it!! I love your videos so much!! such a fabulous card. I love the layout and look. Good use of combining the contemporary with traditional ....different... refreshing.. TFS! I love this card too! The triangles really make the flowers stand out. It's a great design that keeps a crisp clean design. Lovely! Happy birthday Altenew!!! You truly stand apart and have the most beautiful products! I look forward to what comes next!!! AND Kelly, this has got be one of my favorite cards so far! I love the geometric/floral combo! Stunning! And you crack me up!!!! Always love your cards and love the combination of geometric shapes and flowers! Your card is wonderful. I watched your video and found it to be so inspiring. Thanks for showing how it can be done. Stunning card!!! I love that it is simple but bold at the same time!! Plus Kelly you keep me entertained the whole way through!!! Thanks for sharing!! Gorgeous coloring! Love Altenew products! Okay...so I took your advice & didn't watch your video...YET!! Your card is extraordinary as usual & I love the design. I'll definitely come back to the video to learn & to hear your funny comments!! This is gorgeous!! Beautiful flowers and those bold triangles look fabulous in the background! This is so beautiful!! The colors are gorgeous!! Thanks for the amazing inspiration!! Lovely card. Thank you for the inspiration. Great combination of geometric and floral designs! So cool! Gorgeous flowers on your card! So cool Kelly. Love where you ended up putting the sentiment. You shouldn't care what you look like getting coffee at crazy o'clock. None of us are judging you. I never would have thought of it, but those triangles create the perfect background for these flowers! beautiful! I love your flowers and your coloring! But the geometric triangles really makes your card pop! How did you come up with that idea?! The sentiment along side one of the triangle's sides is perfect! Lovely! Just thinking outside the box ( or triangle ) with your always gorgeous coloring. One of the things I love about Altenew is the variety of designs from which to choose, especially the florals...my favorites! This is gorgeous!!! I love, love, Love the sentiment along the side!!! I have never thought to do that! Your coloring is amazing! And I love what you did with the triangles!!! Love your flowers! Even with your little booboo on the extra bud! You always make me smile! Thanks so much! Kelley you are so good a making new designs. Love the triangle background. What a fabulous design, and your coloring is equally fabulous. So pretty!